You will find that the have an exceptional amount of continually blooming pink flowers. 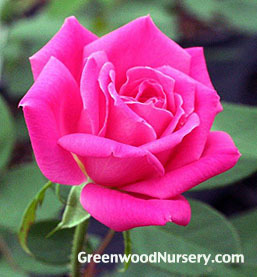 Even more than twice the amount of its sister, the single Knockout Pink Rose. This is a great fast growing flowering shrub. Without dead-heading, the blooms of this Double Pink Rose maintains a continuous show of color from early June to hard frost with beautiful foliage almost year-round. The foliage is deep mossy green with blue and maroon highlights. Fall foliage is deep, lustrous purple with rich maroon undertones. The Double Knockout Pink Rose Bushes are denser, more compact rose (3 to 4 feet) and upright in fashion than the standard Knockout's 5 to 6 foot height and broad, spreading form. This sister to the Knockout® rose puts a great deal into its value as a landscape rose, from its four season appeal to its natural resistance to black spot, as well as other diseases and insects. Double Pink Knockout® Rose - Rosa 'Radtkopink' PPAF is a spectacular addition to every garden. Along with the eye-catching blooms and superior performance it offers wonderful versatility of use-from specimen planting to several planted among your favorite perennial plants, or an ideal way is to plant them as an appealing barrier hedge.